For example we take as granted that energy is conserved (Energy conservation Principle). Imagine someone “build” a theory where the energy conservation doesnt apply. Scientific community should reject this theory. But what if in the future conservation of energy doesnt apply ? Then the theory would be correct (assuming it predicts phenomena , is mathematic formulated etc.) ? I mean we reject or accept theories based on “axioms”. (It seems impossible to violate the energy conservation but we just have accepted).Does this mean that we are even doubt if a theory is right or wrong ? Question: For example we take as granted that energy is conserved (Energy conservation Principle). Imagine someone “build” a theory where the energy conservation doesnt apply. Scientific community should reject this theory. But what if in the future conservation of energy doesnt apply ? Then the theory would be correct (assuming it predicts phenomena , is mathematic formulated etc.) ? I mean we reject or accept theories based on “axioms”. (It seems impossible to violate the energy conservation but we just have accepted).Does this mean that we are even doubt if a theory is right or wrong ? Answer: We (I mean, contemporary scientists) do not take for granted that energy is conserved. The energy conservation law came from observations and experiments. And we do not reject or accept theories based on “axioms”; we do/don’t do so based on the existing evidence. What's more, we always doubt that any currently accepted theory may be wrong. That’s why we always do a lot of various experiments to verify it (i.e., to see if it’s right or wrong). 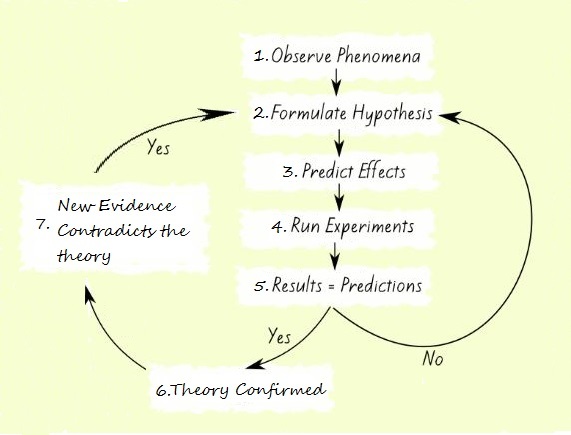 Scientists nowadays use the method called “Scientific Method” (e.g., see ref 1 and ref 2) to find a theory that can account for the phenomenon in questions (see step 1 to 5 in the figure below). Even if, such a theory (6) is found, continuing experiments and new evidence (7) can disprove it, and a new theory has to be found by beginning the process (2 to 5) again. So, any theory can never be guaranteed to stand forever un-disproved, not even the current thermodynamic theory, Einstein's Relativity theory, or the current quantum theory. Question: Can a theory that is now wrong be right in the future? And, of course, a theory that is now right can prove to be wrong in the future. This is obvious from the figure above (i.e. when conflicting evidence to the theory is found - step 7). Real-life examples are several past theories that are now proved to be wrong, such as the theory that the earth is flat, the Aristotle’s theory of gravity (which states that objects fall at speed proportional to their mass), the theory of light that is exclusively corpuscular (such as Newton’s) or exclusively wave (such as Huygens’), a classical physical theory that holds that measurements of time and distance are absolute and not dependent on observers, and a classical physical theory that concludes that physical events can be definitely predicted. There was that period of time between 1690 and 1801 where Huygens's Treatise on Light (wave theory of light) was considered bonk while Newton's Opticks (corpuscular theory of light) reigned supreme. Wait a minute -- your question states "a theory that is now wrong be right", whereas your conservation example describes "a theory that is now right be wrong". Re your explicit question, a now-wrong theory is presumably wrong because there exists ubiquitous experimental refutation of its predictions. And that's very unlikely to change (although, very occasionally, the outcomes observed from particular experimental designs have later been found to have originally been misinterpreted). So, basically, "No", a now-wrong theory won't be right. But, re your example, and as already pointed out, once-right theories have frequently been later found wrong. They originally agreed with the then-available observational evidence, but ultimately disagreed with subsequent observations. In many cases, the original theory turned out to be a sensible approximation to the later-and-better theory. An example where that's not the case is the ancient Greek epicycle theory of planetary motion. Epicycles preserved the idea that the planets revolve around the Earth, but that entire conceptual basis was eventually found completely wrong. Absolutely. I'm not aware of any examples, but we have no proof that the laws of physics are fixed. Every day, we wake up and see the laws of physics are the same. We wake up in our beds and gravity still works. Most people  would go as far as to bet that they won't change tomorrow either. However, we have no proof of that. I think it is a matter of consensus among the scientific community. Nothing is written in stone and theories are accepted as long they can pass the checkup against the current framework of facts taken as true by the community shaping our conception and knowledge of reality. Just proving wrong a single fact doesn’t automatically make valid a discarded theory that was based upon the opposite of the fact, it needs to be again compared against the framework to ensure that all conditions are satisfied. In other words, the theory makes sense within the new knowledge about reality. The more relevant question is whether a theory can be right, or just good enough to explain what we observe. A theory that is wrong is wrong and one that is right is right, and clearly one that is good enough now may not be good enough in the future. But one that is not good enough now involves an observed contradiction or leaves a gap. But what we have observed, changes. If there is an explanation that proves the observed contradiction was only apparent, then our currently inadequate theory might then suddenly be adequate. And if another theory fills the gap, or proves it cannot be filled then this one may suddenly become adequate, too. An example might be Einstein's cosmological constant. It was inadequate at the time because there was no reason for it, it left an explanatory gap, and it seemed too ad-hoc to be realistic. But now we find there is another force at play, 'dark energy', and it would give a reason for this constant and make the theory less ad-hoc and therefore appropriate. What is wrong with Popper's theory of falsification? Is it right to say that pseudoscience confirms the past?